As an admin, you can choose to set default restrictions for student access in your institution. These restrictions include student access to courses before or after the start and end date. These restriction settings can be used independently or in conjunction with override course start and end dates for the course. If no override dates are specified for the course, the start and end dates apply to the term dates. However, instructors can add override course and end dates. 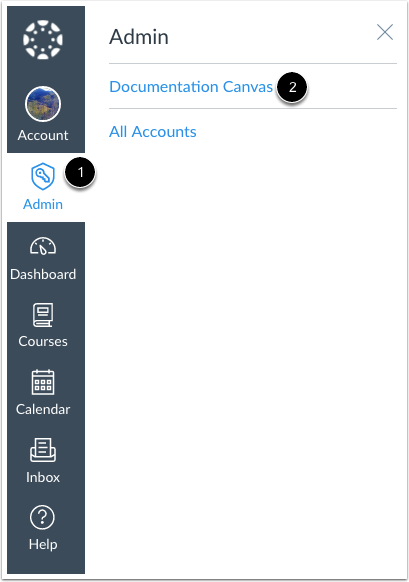 To manage student access, you can set the default value but allow instructors and sub-account admins to edit access for the course and sub-account levels as necessary, or you can set and lock the student access setting for the entire institution. 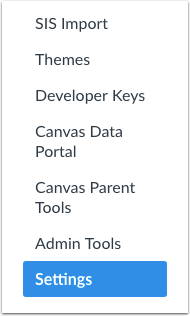 The checkbox settings at the account level are passed to the sub-account and course levels as default values. Restrict students from viewing future courses in enrollments list: When a student enrolls in a future course, the course displays in the Future Enrollments section in the student Courses list. However, when the view courses before the start date restriction is enabled, a second option is displayed to completely remove the future enrollment from the Courses list. This setting can also be enabled to keep students from knowing they are enrolled in a course with a future start date. Note: Although any changed section dates override course dates, student access restrictions cannot be set at the section level, and restriction options apply to all sections within the course. In the Account Settings tab, locate the course restriction options. By default, student access checkboxes are not selected, meaning students can view a link to any enrolled future course (after they accept their course invitation) or a concluded course. To retain this default for the entire institution, do not select any checkboxes. The student restriction checkboxes set a preset for all new courses created in the account, as well as section override dates. The lock settings apply immediately to all existing courses and section override dates in the account. To set a default for the entire account so that students cannot view a link to the course before the start date, click the Restrict students from accessing courses before start date checkbox . When selected, the course is inaccessible before the course start date. If the course dates are blank, the start date applies to the term start date. If you want to lock the default setting for sub-accounts and courses and apply the change immediately, click the Lock this setting for sub-accounts and courses checkbox . When you restrict students from accessing courses before the start date, you can also restrict students from viewing future courses in the Enrollments list. If you don't want students to see they have been enrolled in a future course, select the Restrict students from viewing future courses in enrollments list checkbox . If you want to lock the default setting for sub-accounts and apply the change immediately, click the Lock this setting for sub-accounts checkbox . To set a default for the entire account so that students cannot access the course after the course end date, Restrict students from viewing courses after end date checkbox . When selected, the course is inaccessible after the course end date. If the course dates are blank, the end date applies to the term end date. Previous Topic:How do I warn users in an account about using non-institutional email addresses for confidential information? Next Topic:How do I change the language preference in an account? Table of Contents > Settings > How do I restrict student access before or after a course date at the account level?